On why the Puritans came the America…. Posted by scoop2go in Assignments. Comments Off on RELIEF!!!!! and UPDATES! I know you all did great on the test today! I hope you have a safe and relaxing weekend! Next week the schedule for PHS will be BBCCA due to EOC testing. We will have our last test Tuesday, May 17. It will be over Chapters 39-41. Please bring all of your AP study materials to class next week so that we can debrief about the test and I can evaluate our review process for myself. Bring all missing work to class next week so we can fill in the holes on your grades. 8. 1846- Oregon Treaty– The southern half of the Oregon Country is ceded to the US on June 15 as the US prepared for war with Mexico. The US does not insist on its claim of “54’40° or Fight,” but instead continues the 49th parallel, approximately as the boundary between the US and Canada to the Pacific, with Canada also receiving all of Vancouver Island. But we have other territory which is not parts of states. AND also… the US claimed uninhabited islands to mine bird and bat poop throughout the world based on the Guano Islands Act of 1856. 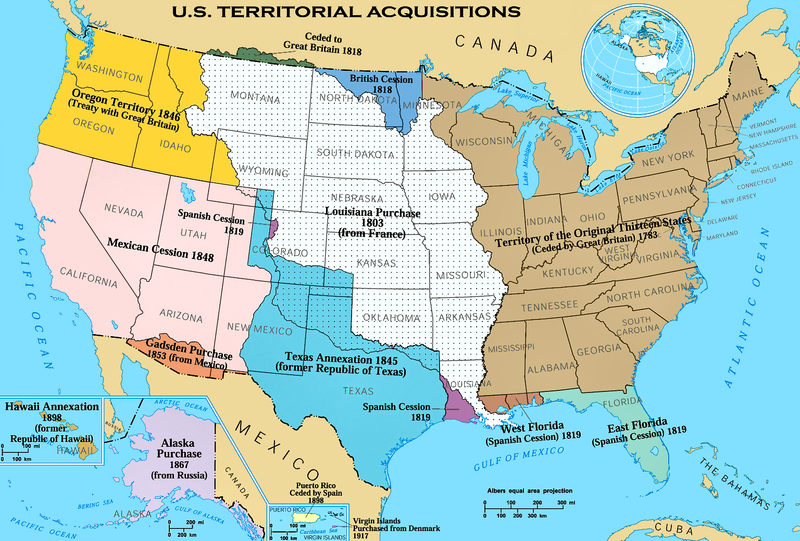 And we gained territory from the Spanish- American War…. And we gained territory from World War II. 12- WASHINGTON, JACKSON, W. HARRISON, TAYLOR, PIERCE, A. JOHNSON, GRANT, HAYES, GARFIELD, ARTHUR, B. HARRISON, EISENHOWER Which presidents had held the rank of general? EISENHOWER- 5 STAR GENERAL Which president held the highest rank in the US military before election as president? T. ROOSEVELT, NEGOTIATED END OF RUSSO-JAPANESE WAR IN 1904 Which president was the first American to receive the Nobel Prize, and why? T.ROOSEVELT 1905, WILSON 1919, CARTER 2002, OBAMA 2008 (VP GORE)Which presidents have received the Nobel Peace Prize? WILSON president with a Ph.D.
42 If Barack Obama is the 44th president, how many presidents have there been before him? 26 how many presidents were also lawyers?